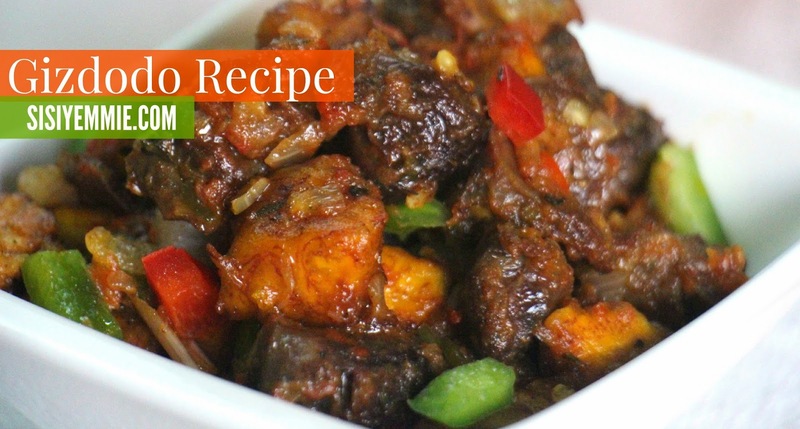 Forget all the senrenren-Gizdodo is basically gizzard, dodo and stew, but let's be fancy and call it Gizdodo and have a proper recipe for it! If you find that you learn better watching (I do) then click play on the video below to watch...spend your mb's well. Also SUBSCRIBE to my YouTube Channel -it's free! Wash gizzards properly (I rarely eat gizzards I didn't prepare myself because I'm paranoid it wasn't washed properly, but I'm a hypocrite. Shebi I eat every other thing, how am I sure they were all properly cleaned? LOL). I typically wash my gizzard like 10 times, with warm water and some salt- there's a yellow lining in the gizzard, please take it off. Ayamakata. Add gizzards to pot, season as you normally would - with salt, thyme, curry, onions, maggi and allow cook for about 40 minutes. I like to cook mine till the stock is almost dry so that all the juiciness enters the gizzard. Cut ripe plantain into cubes (it doesn't have to be perfect cubes) and deep fry. The healthy option is to put it in the oven but it ain't dodo if it doesn't go into that big pot of oil. Cut your cooked gizzards into smaller pieces to it can match your cubed plantains, then fry till it's brown. Again, if you're team fitfam you can choose to grill instead of fry. In the oil used to fry the gizzard, add some curry first, then thyme, then onions and chopped green pepper (your whole neighborhood will be wondering where the tantalizing aroma is coming from) add your tomato mixture and allow to fry. When it is cooked, pour in your fried gizzards, add some of the stock (that's why I make sure my stock is properly thick to reduce the quantity). Taste for salt. Cover and allow the gizzard and stew to cook together for about 3 minutes. Finally add the dodo (that's if you've not finished pinching it), Combine together, allow simmer. That's Gizdodo! It's very very very very very delicious! Try it! Chai! Am at work and you're making me hungry. Would definitely try this out. This looks simply delicious. It's looking simple now ooo, until I try it and over use oil or over stock or over something. hmmmn,i once read it in the papers and was like 'okay' but now eh...gasss try it! I want!! I will try the recipe when I am in a good mood.. I haven't even eaten it before.. I am def trying this. Things that make me hungry!!! Looks yummy. Mine never comes out as juicy. Lol. The beauty in simplicity! Definitely trying Gizdodo.